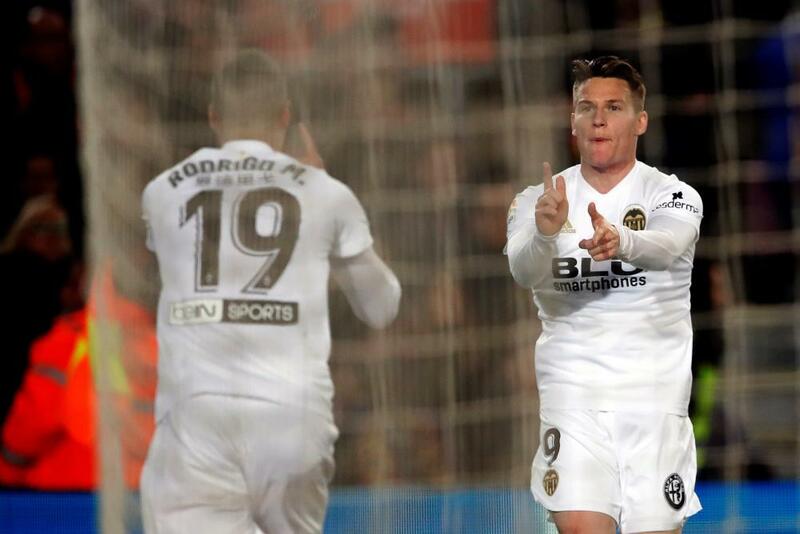 Valencia ended a good week with a combative display against Barcelona, coming away from the Nou Camp with a point, though it was after having been 2-0 ahead. A few changes in the line up, probably with a few players tired after the midweek exertions and the Copa game also coming up. Gameiro was preferred over Mina up front, Wass started instead of Soler on the right and Lato came in for the injured Gaya. Valencia started strongly, putting down a marker from the beginning. A good move saw Parejo force a save from Ter Stegen and Cheryshev hit the post from the follow up. After the 10th minute, Barcelona began to take more control of proceedings, pushing up, passing around but finding the defence well-organised and it was Valencia that drew first blood. Messi was dinking around, trying to find a pass through, but Parejo dispossessed him and found Gameiro whose pass found Rodrigo. He made a great driving run then played an excellent ball into space for Gameiro to fire across Ter Stegen for the opening goal. Barcelona pushed up, but got caught out again, Valencia broke and Cheryshev's cross was good, with Wass being bundled over for a penalty which Parejo converted in style. Barcelona hit back later in the half, with Semedo going down in the area after taking a touch from Lato. It was dubious, but just about allowable under VAR and Messi slotted home from the penalty spot. Unfortunately, Gameiro had suffered concussion earlier after a clash of heads and had to go off to be replaced by Ferran. The second half followed a similar pattern. Most of the time, Barcelona were passing around about 30 metres from our goal. We had the occasional breakaway with a couple of half chances falling to Rodrigo and Wass, but nothing concrete. In the 63rd minute, Lato lost the ball, Messi picked it up and managed to curl it around a group of Valencia players, with Neto having no chance. 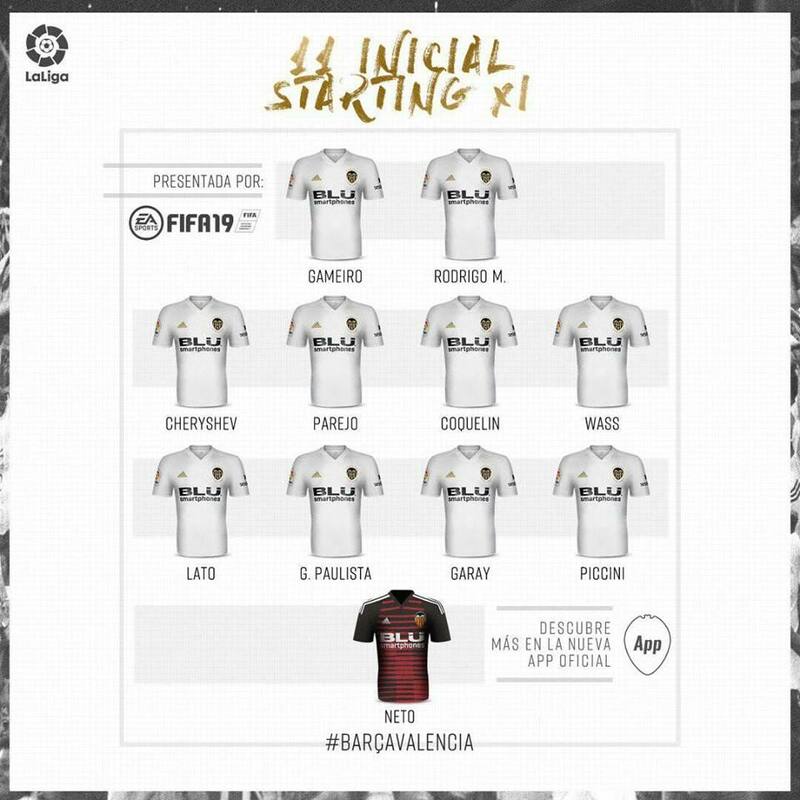 Though Gabriel was struggling a bit, he stayed on, with the welcome return of Kondogbia after a 2-month absence and Mina coming on for Rodrigo. Overall, it's a little disappointing we couldn't hold the early lead, which would have capped off a great week, but we'd all have happily taken a point from this one at the beginning, with Barcelona coming in to the game with 8 straight wins in the league so this is a result which will keep morale high. Neto 7.5 - had a very good game, making a number of key stops. Not a lot he could do about the goals. Parejo 8.5 - an excellent game which continues his purple patch. Dispossessed Messi on more than one occasion and was a lively presence at both ends. We need him like this.